Oct 9-11, 2017) $275 Status: Newly announced trip; up to 7 spaces available! Late autumn season in the Adirondacks is a special time of year, just after most tourists have left the Adirondacks and gone home leaving the woods and waters quiet, and yet still there is an explosion of autumn color both on the trees and covering the forest floor. Around Columbus Day there is still excellent fall color especially in the lower altitude Schroon Lake and Lake George regions where it lingers for a couple weeks longer, when the oaks are the last of the trees to turn, from their hues of maroon to brown. This is also the best time of year for photographing panoramic vistas over Lake George in the southeastern Adirondacks, with crisp late autumn days with low humidity and long sight distances in the clear air. Numerous hike-up mountain summits encircling Lake George provide vistas overlooking the lake, fall foliage, and distant High Peaks. We'll also photograph around Schroon Lake, the location of many of our workshops over the years, as it provides some excellent nearby forests to photograph among. Photographic locations on this workshop will thus be around Schroon Lake, Lake George, and part-day excursions further afield to Belfry Mt, the Pharaoh Wilderness region, Elk Lake Preserve (private access only), and more locations. For all vistas over Lake George, pre-dawn or post-sunset hiking is required of up to 2 miles each way. This 2.5 day Adirondack photo workshop will start at 3:00pm Monday October 9th (Columbus Day) and conclude at 12:00pm Wed October 11th, 2017. Overnight base location will be Schroon Lake which is easily accessible and ideally located in the Southeastern Adirondacks, at the Silver Spruce Inn bed and breakfast, which is old-style Adirondack B&B rich in regional and prohibition-era history, with a charming host and excellent facilities to host our group. Website: www.SilverSpruce.com . Please call up Silver Spruce Inn to reserve your room, which are already blocked out under the trip leader's name, or alternatively contact the trip leader to enquire about possible room- mate matching service before booking a solo room. May 19-21, 2017) $250 Status: Sold out! 7 of 7 places filled up! Springtime in the Adirondacks is a wonderful season, with the vibrant, fresh green colors of new spring foliage. Abundant wildflowers including trout lilies and trilliums dot the forest floors and spring snow melt from the mountains overflow streams, creating compelling creek compositions of rushing spring waters, mossy rocks, and swirling foam. These are the scenes we plan to photograph, unique to the freshness of springtime, including the Sacandaga River East and West Branches, Georgia Brook, Auger Falls, Indian Lake, Lewey Lake, and many more streams and cascades of southern Hamilton county. 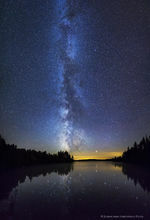 This 3 day Adirondack photo workshop will start at 3pm Friday May 19th, and conclude after sunset on Sunday May 21st although you may head home earlier on Sunday if a longer drive is ahead. 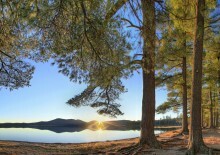 We'll be based out of a lakeside hotel in the charming Adirondack small town of Speculator. (recommended motel is Lake Pleasant Lodge, and you get small discount by mentioning my name when booking). Sept. 29 - Oct. 01, 2017 $275 Status: Sold out! 7 of 7 places filled up! Autumn peak foliage color in the Adirondack region is a spectacular time of year, and the Adirondack Mountains offer some of the best foliage viewing anywhere in America especially for the vibrant red colors of the sugar maples. From lower mountain top peaks we can overlook red-filled valleys nestled below the High Peaks, and down below the forests are filled with bright yellow and reds which make for amazing forest compositions. Lakeshores offer reflections of color on calm mornings, with abstract patterns of white birch trunks and red maple trees offering telephoto and panoramic options. 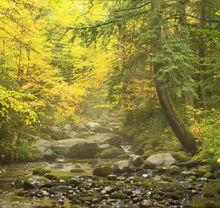 Photographic locations will be throughout the northern High Peaks mountains region incl. 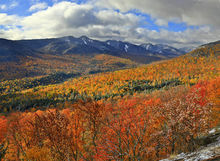 Lake Placid, Keene Valley, Wilmington, and also the southern views of the High Peaks around the private Elk Lake and Newcomb area. This 3 day Adirondack photo workshop will start at 2:30 pm Friday 29th September and conclude at 12pm Sunday 1st October 2017. Overnight base location will be the charming Adirondack small town of Keene Valley in the heart of the High Peaks mountains, at the Trails End Inn, which is outdoor-friendly and a large, old-style Adirondack bed and breakfast. It is highly recommended (but not required) that you book here, as our indoor session will also be located here, and Trails End Inn has the most room options in Keene Valley area. Website: www.TrailsEndInn.com Fri and Sat. overnight bookings are yours to make, but feel free to contact the leader for specific lodging questions and possible roomate matching service before booking a room. 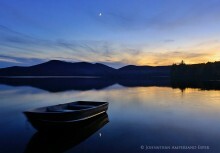 Workshop Details: These workshops are an affordable and superior way to get to know the Adirondack wilderness while also honing your photo skills. The workshop price includes all professional photographic instruction and guiding. Additionally there may be an extra panoramic tripod head or other camera accessories for participants to try out. Participants must have their own transport to our shooting locations, and book their own accommodations in a pre- determined local town for any nights. Meals are also at the participants' own cost, and we typically will eat dinner as a whole group at pre-booked restaurant. Typically the group will convene before sunrise and do a sunrise and morning shoot, and afternoon photo outing and/or an indoor session, and then again photograph in the late afternoon and straight through sunset. Meals are always worked around our photography schedule, not the other way around, but of course we always set aside some break time for meals or rest.